18th-century (?) red velvet, mostly bald, gilt edges; manuscript cut down to this binding; 2 brass clasps and hinges. In solander box by Sangorski and Sutcliffe, stamped in gold on spine: HYMNARIUS MS. C. 1300. 216 leaves (1 column of 5 4-line staves, 5 lines of text), bound : vellum, ill. ; 66 x 46 mm. S[oror] Anna Maria Hamblech, 1684 (inscription on lower margin of fol. 2); Soror Maria Anna Theresia de Monte Ord[inis] pre[dicatorum], 1773 (inscription on fol. 2); Hector Debacker (bookplate on front pastedown, motto: quaerite et invenietis, St. Luc - C.XI & 9); purchased by Julia Parker Wightman in 1968; JPW 5370; Julia Parker Wightman Bequest in 1994. Ms. hymnal; written and illuminated in Germany, ca. 1300. 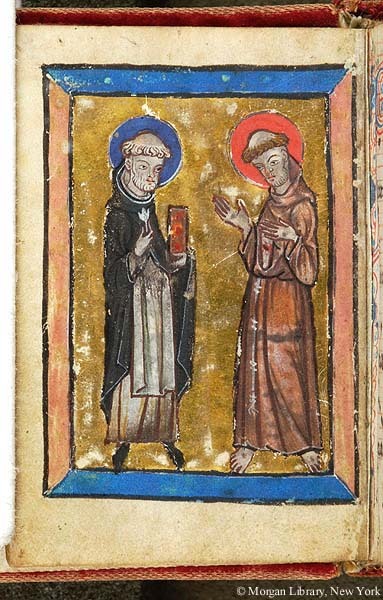 Decoration: 1 full-page miniature (fol. 1v) depicting full-length figures of St. Dominic and St. Francis on gold ground, framed in pink and blue bands. Folios 210v-215v are later additions; folio 216 is ruled but blank. Musical notation: 4-line red staves with square notation.